Nothing catches the eye more than the garden on a house when anyone passes by. To enhance the beauty of your garden adding decorative stepping-stones brings warmth and a message of “welcome” to all visitors. 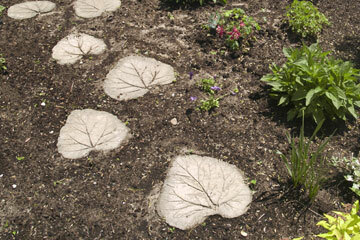 Try adding these simple DIY leaf-shaped stepping-stones to make you dance along the winding path through your garden. Create the cement mix by adding some water to the powder in the large plastic container. Wear an apron and gloves while doing this to prevent any stains on your clothes. Lay the large leaf flat on the cardboard. Keep the leaf’s veiny side up, facing you. Spread the cement on the leaf with a putty knife. Keep the thickness of the cement at least 1 inch high from the sides, and 1 ½ inches high from the center. Smooth the surface and edges with a putty knife and then leave the concrete leaf to dry for 2 hours. When its dry enough to hold its shape, gently turn over your concrete leaf and peel away the leaf from it. This will be easy if you have left the concrete still a bit wet. Once removed, let the stone dry. Once the stones have dried, set them according the path you wish to arrange around your garden. Dig spots for each of the stone by marking with a trowel around it first, and then digging out the grass inside it. Keep each hole 1 inch deep. Place the leaves in each grove and let them settle in a day.